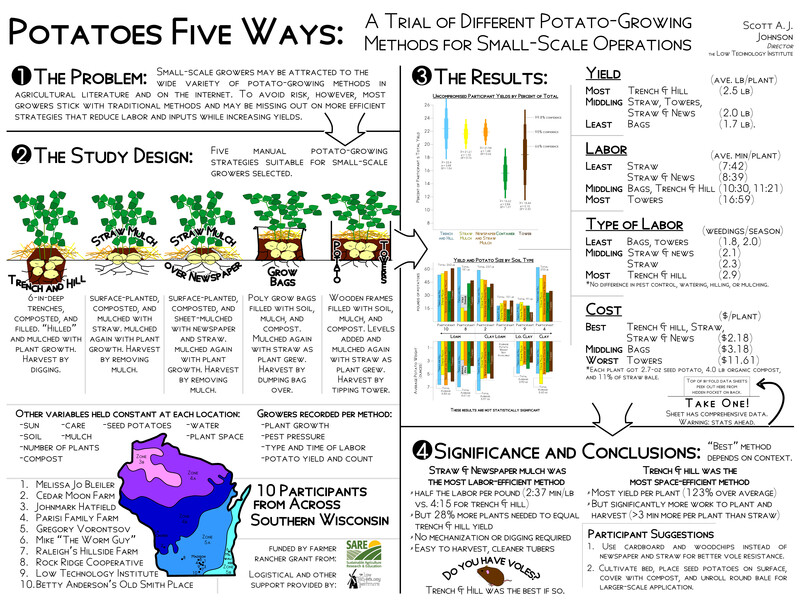 We had about a century of potato-growing knowledge taking part in the study: our test group consisted of ten growers, ranging from farmers’ market growers to homesteaders and backyard gardeners across southern Wisconsin. We tested five methods to determine which is the most productive and least labor intensive for the small-scale grower. The first method was trench and hill, which we considered our “control”group. Then we tested two surface-planting methods: straw mulch and straw mulch over newspaper. We also tried two containers: bags and wooden towers. Each participant had five plots, each measuring 8 x 8 ft. Potatoes are one of the most productive plants per area. They grow in poor soils and provide complete nutrition. Ancient and modern growers have devised strategies to maximize yield and simplify growing. Unfortunately these methods have not been subject to comparative study to separate the serious from the gimmicky. 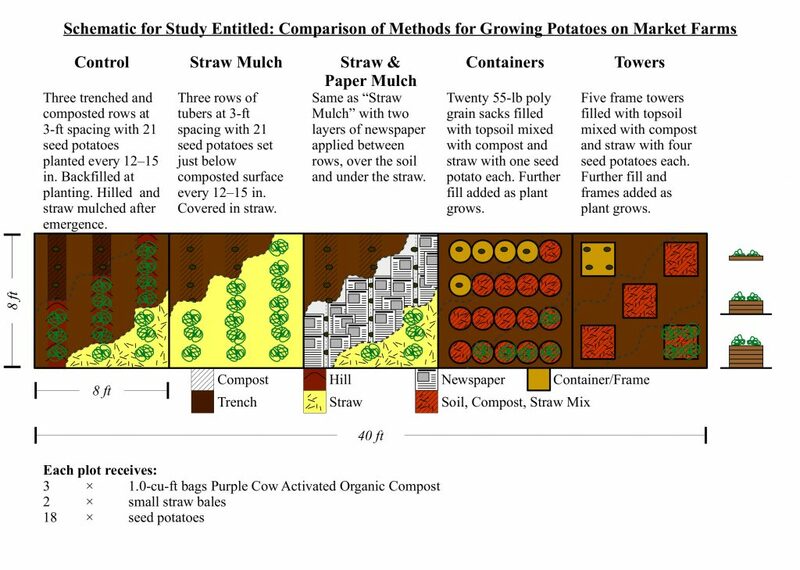 This study will evaluate the relative performance of five small- to medium-scale, growing methods: trenching (control), straw mulch, newspaper mulch, container bag, and potato tower. Each of the ten participants will cultivate potatoes holding all other variables constant: fertilizer, mulch, water, sun, plot size, and type and amount of seed potatoes. Data, segregated by method and collected throughout the season, will include labor, materials costs, weeding, yield, and local soil composition and weather. The outcomes of this study will support sustainable agricultural practices for market-scale farmers. By identifying high-yielding methods, we reduce the amount of inputs (water, fertilizer, labor, and materials) needed to grow a larger crop each year and increase profits over less-productive methods. By tracking the labor as well as yield, we can reduce the sometimes back-breaking work of harvesting and cleaning potatoes. Finally, this information will be of interest to anybody who grows potatoes, not just market farmers. Share results through website, social media, conference presentations, and articles submitted to trade publications. Other methods create a container for the plant. Bags, plastic buckets and totes, barrels, wooden boxes (called“towers”), and even stacked car tires have been used to grow potatoes on the ground, patios, and balconies (tires should be avoided, however, because they leach chemicals). The idea is that if it is good to hill up around the plants, growers can bury plants over and over using containers with high sides, creating a deeper root structure and greater yield. This method is more flexible and easily used by those without access to soil they can trench. To harvest, the containers are tipped over and the spuds are collected. Some towers are designed to be harvested without killing the plant: sides are made up of horizontal boards, allowing the roots to be accessed without upsetting the plant by removing lower boards. We kept other variables consistent except for the growing method: Each grower set aside five small beds (8 × 8 ft each) in full sun. We planted 3 lb of seed potatoes (eighteen plants) in each plot. Each plant got three quarts of organic compost (Purple Cow Activated Compost, 0.7–0.3–0.3) at planting and another quart while growing. The plots in each location were mulched with two rectangular straw bales and got the same sun, rain, and attention. The most productive method was trench and hill. We got an average of 1.81 lb of potatoes from each trench-and-hill plant (minimum 0.31, maximum 3.44 lb) across all participants, but an average of 2.54 lb from those plots not devoured by voles. The straw mulch, straw mulch over newspaper, and potato towers returned about a half a pound less per plant on average whether from all participants (1.31, 1.38, and 1.30 lb respectively) or uncompromised ones (1.96, 1.98, and 2.05 lb). The bag containers were easily the lowest yielding at just over a pound (1.17 lb) for all participants and a bit more (1.70 lb) for those who were vole free. All plants started with a seed potato weighing 2.7 oz on average, meaning even the lowest average yielding method returned a seven-fold increase while the best plots returned over twenty times the seed weight in edible taters. Yield isn’t the whole story, though, as labor is as much of a gardener’s investment as the cost of seeds and materials. 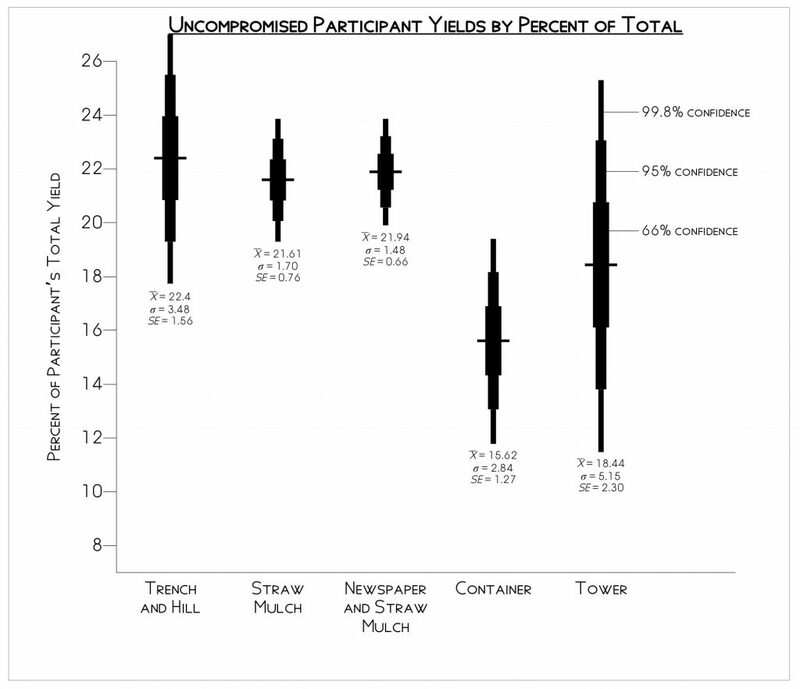 On a per-plant basis, all gardeners averaged the least time on the straw and straw-over-newspaper methods (8:39 and 7:42 min, respectively), a few more minutes on bags (10:30 min) and trench and hill (11:21 min), but twice as much time on the towers (16:59 min) because of the construction of these containers.This means that even though the trench-and-hill plots produced about 139% more than the two surface-planted methods, they took 140% more time, washing out any advantage. If we look at the uncompromised yields, the gap widens, and gardeners were spending almost 178% more time to grow only 130% more pounds of potatoes per plant in the trench and hill plots. 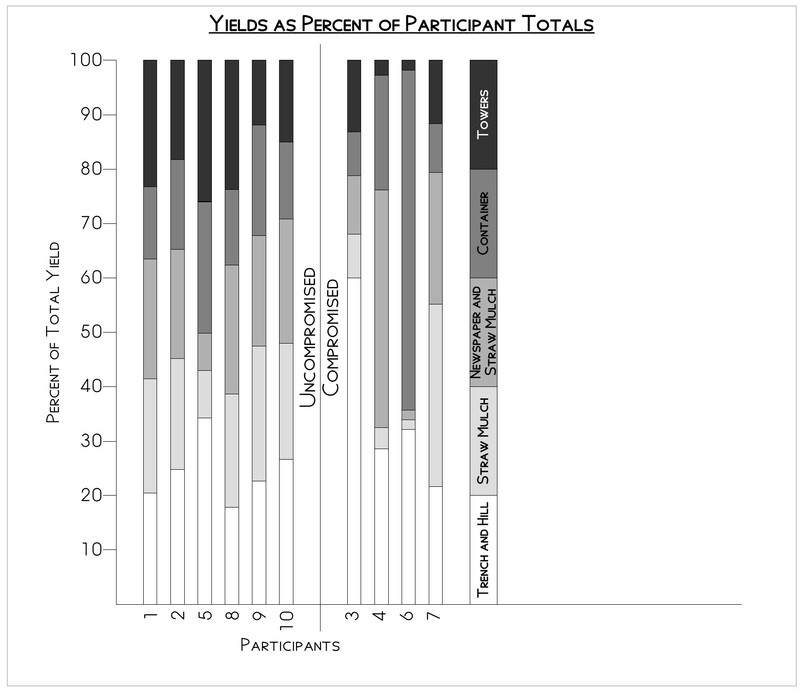 We measured other variables that did not seem to affect yield or labor. 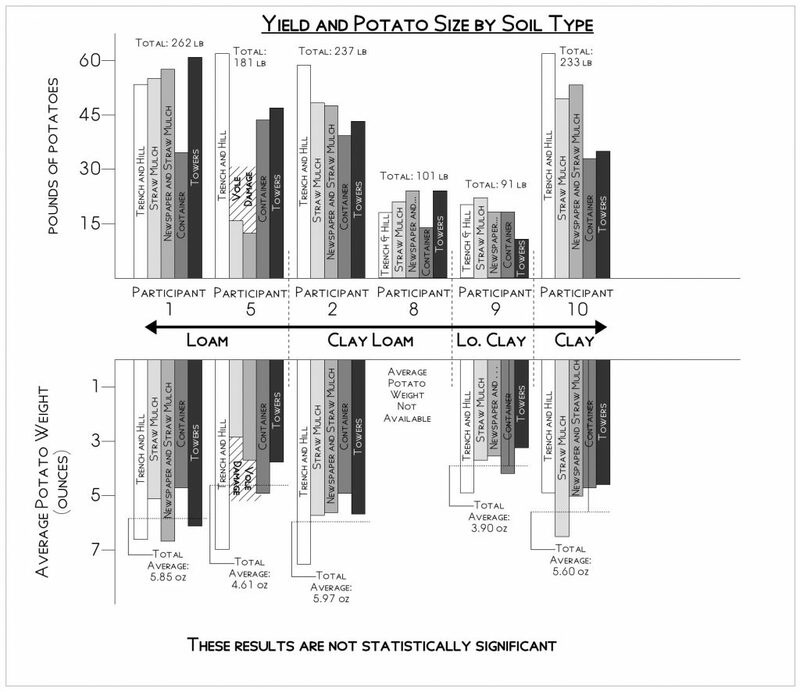 Our soils ranged from loam to clay, but counter intuitively, soil morphology had little effect on the yield or size of potatoes. 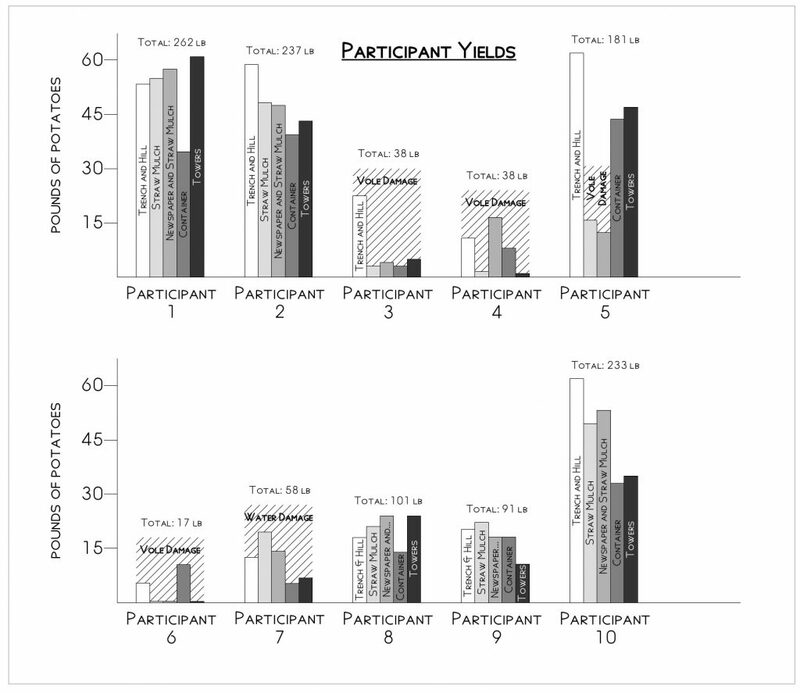 When dividing the total yield by number of potatoes for each plot, we found the average tuber size was also not greatly affected by method of planting: trench and hill potatoes averaged 7 oz each while the surface plantings, bags, and towers hit 6 oz. Other variables that played no discernible role included previous weed pressure, whether or not a bed was virgin soil or established, or what the previous crop was. We worked hard to get the word out about this study. We created a poster and presented it at the 2019 MOSES conference, where we talked to at least 50 farmers and researchers about our study. We are currently writing a technical article for farmers and researchers, already picked up by Acres USA, an organic ag. journal. Much of what we learned is outlined in the results discussion elsewhere. It has given our participants (and other farmers) an idea of different potato-growing practices best suited to their growing situation. Our major barriers were unforeseen variables: water and voles. We were able to overcome them in some instances, but in others the voles prevailed. The major advantage of a paid research project such as this is that farmers are able to try a potentially useful strategy without risking his/her crop on an untested system with no compensation if it fails. Or I send them the following poster.